At TERMS, we manage your environmental challenges with integrity, efficiency and customer-focused attention to detail. We offer innovative, cost-effective solutions to a broad client audience. We assess and manage environmental and health issues to address immediate challenges and to take steps to prevent future liabilties across all water, soil and air quality regulatory requirements. We solve problems and successfully meet client objectives. All TERMS clients benefit from our high technical and scientific skills combined with a deep understanding of regulatory practices. Our professionally-trained and certified staff provides a diversity of expertise and experience to ensure protection to our clients, the community and the environment. TERMS proprietary document storage and retrieval system offers a valuable alternative to traditional methods of managing the large volumes of data that usually exist when dealing with environmental matters. Efficiently handle the entire environmental documentation process. Eliminate wasteful and costly document printing, shippping, and storage. Quickly access essential information in as much or as little detail as necessary. 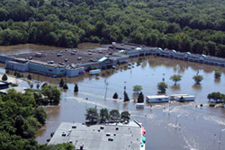 Recent flooding in the Northeast has raised concerns about the potential impact on human health in both residential and commercial properties. Get guidance from the Centers for Disease Control. Learn about TERMS Mold Mitigation and Remediation Program. Careers Contact Privacy Legal © 2011 TERMS, Inc.